Looking up Cornhill from Washington Street, on April 14, 1897. Image courtesy of the City of Boston Archives. This narrow cobblestone street in downtown Boston connected Adams Square with nearby Scollay Square, and it was once a major literary center of the city, with many bookstores and publishers. 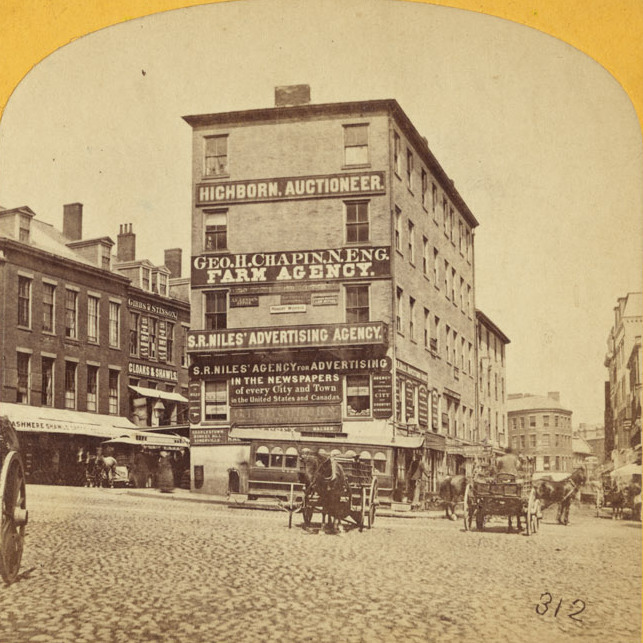 When the first photo was taken, the early 19th century buildings here had a variety of businesses, with signs advertising for carpets, furniture, wallpaper, signs, trunks, and rubber goods. 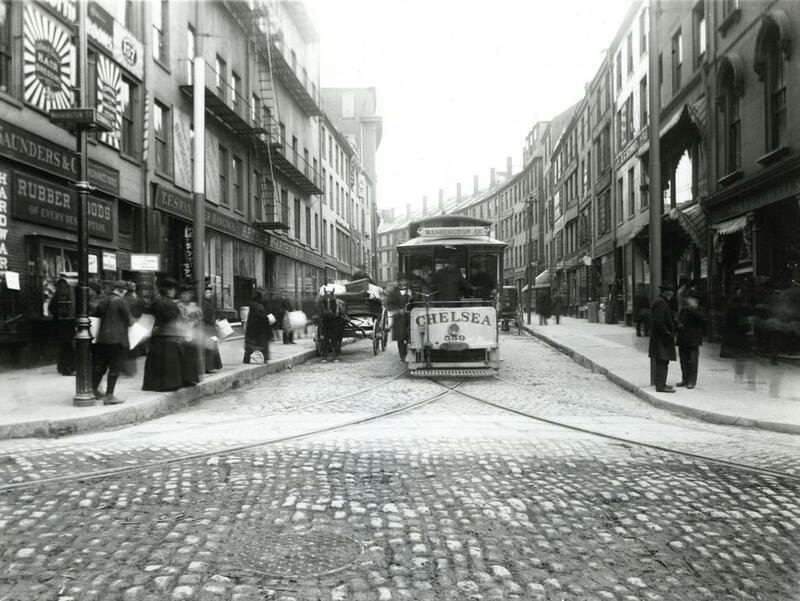 The first photo also shows a trolley coming down the street from Scollay Square, but this would soon change with the opening of the Tremont Street Subway in less than five months. Part of it was built under Cornhill, and it was the nation’s first subway, allowing trolleys to avoid the congested streets between Boston Common and North Station. 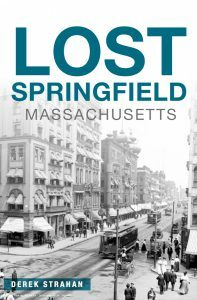 Nearly all of the buildings in the first photo were demolished in the early 1960s to build the Government Center complex. City Hall is just out of view on the right side of the 2016 photo, and the only building left standing in this scene is the Sears’ Crescent, partially visible in the distance on the left side of the street in both photos. 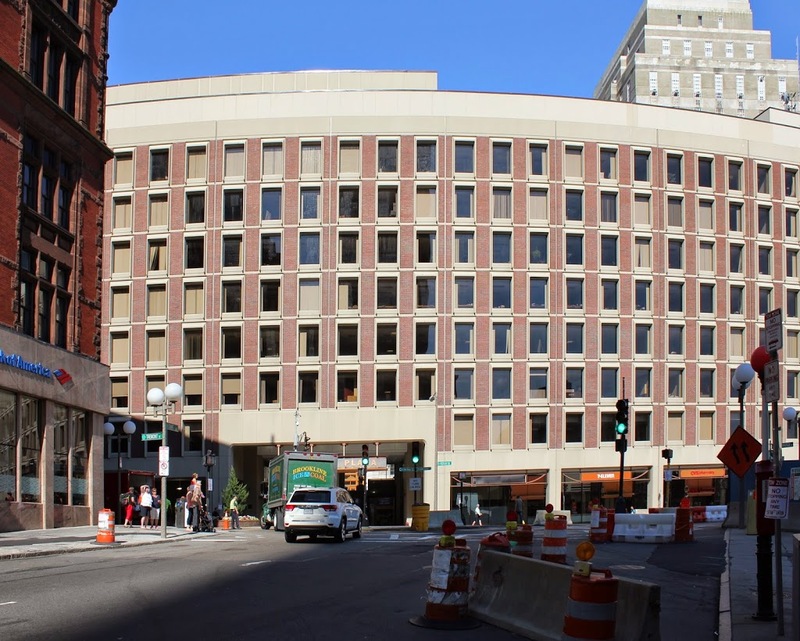 Built in 1816 and renovated around 1860, this building still follows the original curve of Cornhill, serving as a reminder of what the neighborhood looked like before one of Boston’s most controversial urban renewal projects. Scollay Square in Boston, around 1906. Image courtesy of the Library of Congress, Detroit Publishing Company Collection. 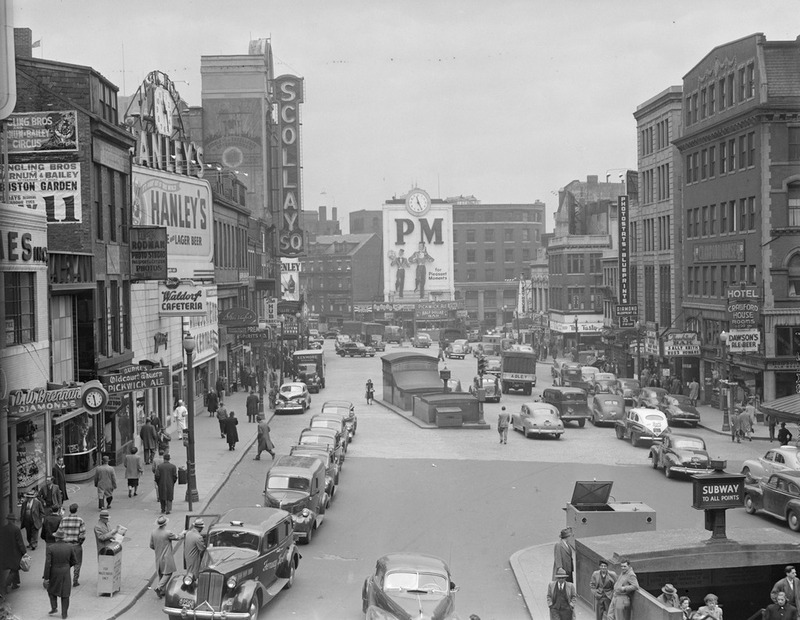 Scollay Square is one of the more dramatic, and perhaps infamous examples of urban renewal in Boston. Located at the corner of Tremont and Court streets, it was a busy commercial center for several centuries. 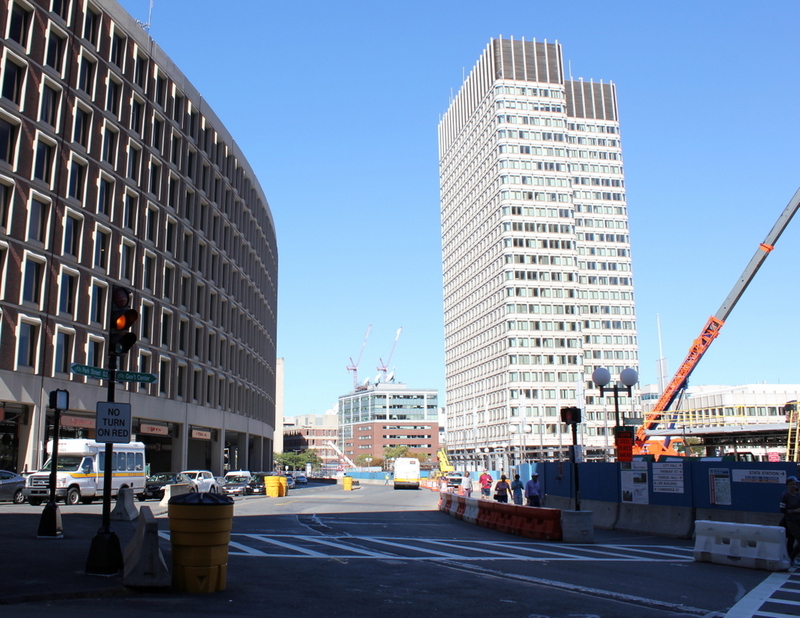 However, by the 1950s it was a seedy neighborhood with low-income residents, so the entire area was demolished in the 1960s and replaced with Government Center, which included City Hall and City Hall Plaza (just to the right of where the 2014 photo was taken). 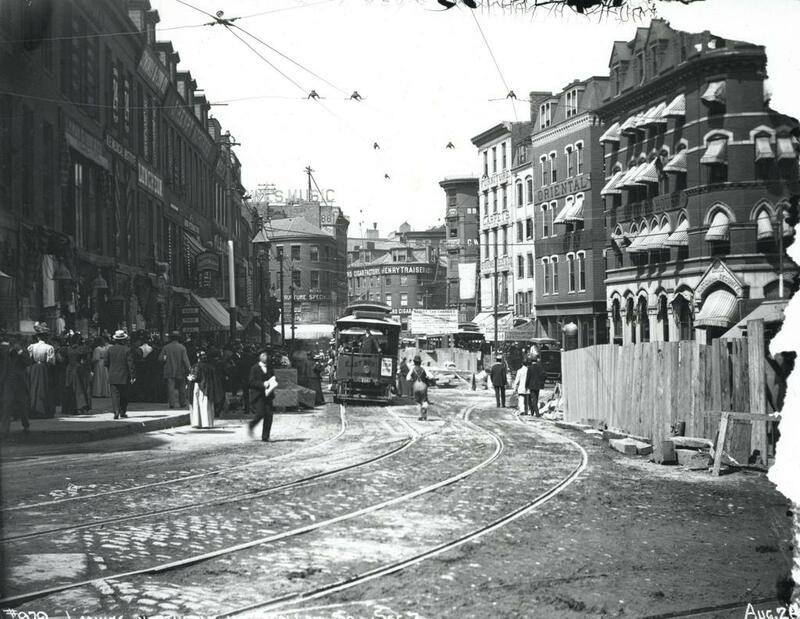 The two small buildings in the center of the square in the 1906 photo are two different subway stations; the one in the foreground is Court Street on the East Boston Tunnel (present-day Blue Line), and the larger, more ornate one in the background is the Scollay Square station on the Tremont Street Subway (today’s Green Line). This was the original terminus of the East Boston Tunnel when it opened in 1904; it extended from Maverick Station in East Boston, and ran under Boston Harbor and up State Street to here. 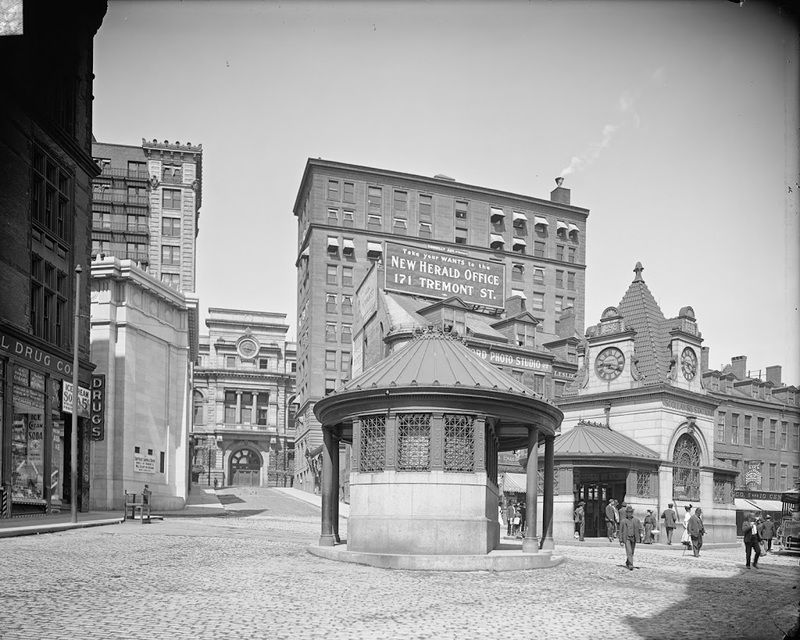 In 1916, the line was extended to Bowdoin, and the Court Street Station was closed, and a new station was opened under the Scollay Square station; not surprisingly, it was called Scollay Under. Today, very little remains from the 1906 photo. 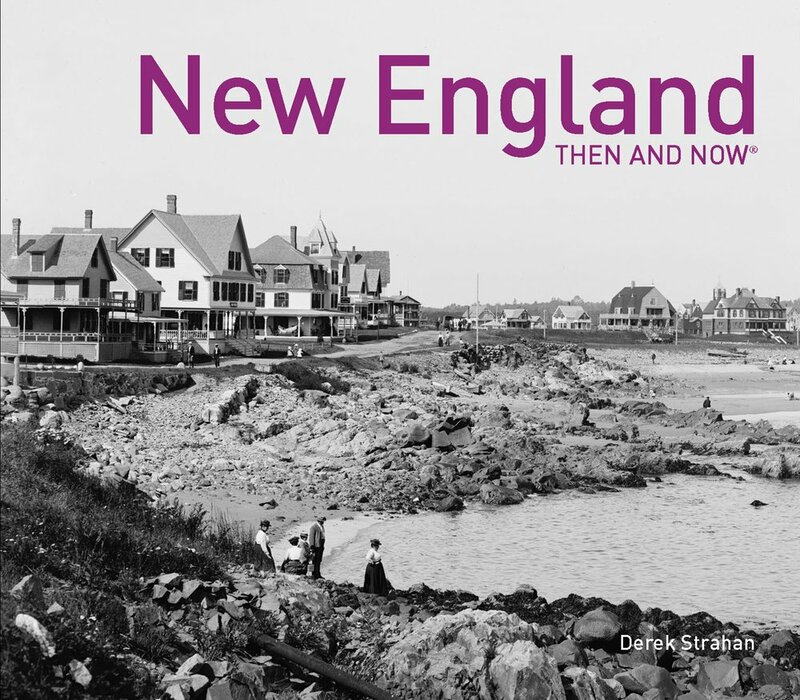 Only two buildings survive; the one on the far left (modern-day Bank of America), and the Suffolk County Courthouse, visible in the distance in left-center (and no longer visible from this spot today, although it’s still there). 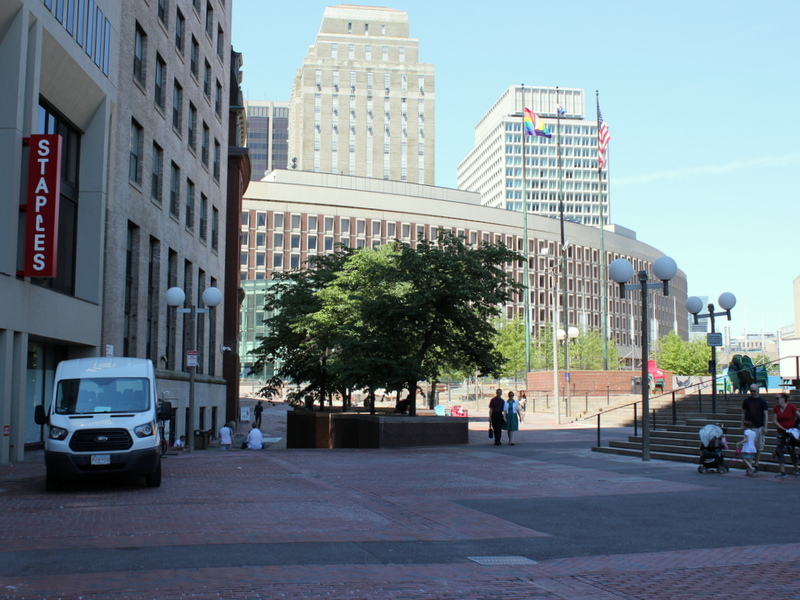 Even the subway station has changed; the Blue and Green lines still meet here, but it is now the Government Center station, and the entrance is further to the right, at City Hall Plaza. The station itself was reconstructed in the 1960s, and is currently being reconstructed again. It was closed earlier this year, and is not scheduled to reopen until 2016.